Successfully Added Quad Band Touchscreen Cell Phone - Dual SIM + Large Display to your Shopping Cart. Quad band 3.0 inch LCD cell phone with dual SIM. Have you previously been frustrated with the small screen size and frustrating keypads available in today's cellphones? Having a crystal clear polarized 3.0 inch display and built in stereo speakers, this is one functional mobile phone that is a cut above the rest. This smartly designed unit has a beautiful QVGA screen that puts other phones to shame. Add to that the easy to use extended function keypad and you have yourself mans new best friend! With native quad-band GSM/GPRS to keep you connected all around the world and dual SIM slots (with dual standby) allowing you to have two active phone numbers in the same phone, its like having two full featured mobilephones packed into one! Did we say full featured? Let us tell you what you get with this mobile phone; FM radio receiver, MP3/MP4 player, digital camera and video recorder, image viewer, portable file storage, and even an Ebook reader. However, phone functionality and ease of use are where this baby shines. The display on this phone is so sharp, and the navigation menus simple to use via touch or the keypad, that all the other great features are just like an added bonus. Order yours today and get ready to give up the eyestrain you have been having with your previous phone. 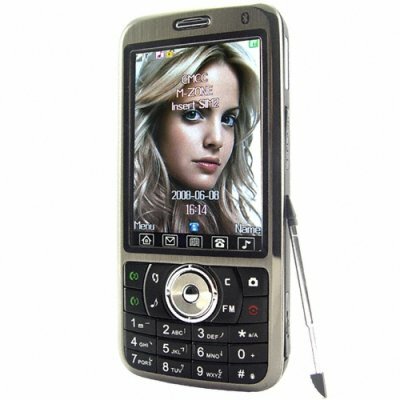 The CVSCY-9400 quad band touchscreen mobile phone is proudly brought to you by Chinavasion Electronics. Order your stock now and don't forget to sell your customers additional add-on accessories like belt clip cases, protective sleeves, and Bluetooth earpieces to maximize your profits. NOTE: This mobile phone is compatible with the four worldwide standard GSM frequencies of 850Mhz, 900MHz, 1800MHz, 1900Mhz. It can be used anywhere in the world. What is Dual Standby? Can this Dual SIM phone use two SIM cards at the same time? Dual standby means both SIM cards are open to make and receive calls (however you cannot receive two calls simultaneously). You also have the option of only turning on 1 of the SIM cards, which is great if you are a frequent traveler and do not want to incur long distance roaming charges on the other SIM card. Does this cellphone use TF cards? Yes, the phone comes with one microSD (TF card) included. How much would an extra battery cost? Nothing. This phone comes with two Li-ion batteries. thats what everyone needed,a cheap dual sim phone easy to handle. on 2010-07-01 12:59:17 Great phone and amazing price!! !